Under the guise of a "study trip," a group of students from Shiroiwa Junior High School in the fictional town of Shiroiwa (Kagawa Prefecture) are gassed on a bus. They awaken in the Okishima Island School on Okishima, an isolated, evacuated island. They learn that they have been placed in an event called the Program. According to the rules, every year since 1947, 42 third-year high school students are isolated, and each student is required to fight to the death until one student remains. Their movements are tracked by metal collars around their necks, which contain tracking and listening devices; if any student should attempt to escape the Program, or enter declared forbidden zones, a bomb will be detonated in the collar, killing the wearer. If no one dies in a 24 hour time period, there will be no winner and all collars will be detonated simultaneously. Note: The TokyoPop version was extensively rewritten by Keith Giffen which eventually led to contradictions and plot holes in the later volumes. 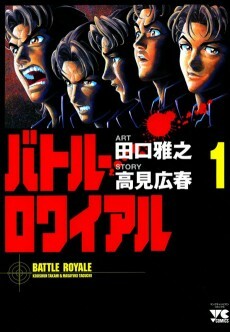 TokyoPop rereleased the series in 5 omnibus volumes under the name "Battle Royale: Ultimate Edition" from October 16, 2007 to February 10, 2009.